It’s almost that time of the year again. No two people really seem to agree on it as a whole, but the PFA Team of the Year will be announced soon. While there are some unopposed inclusions in the list, there will be some that cause a fair amount of debate. We take a look at our selection for the Premier League’s best team of the season. The first in the Premier League Team of The Year predictions is Alisson Becker with 17 clean sheets and fewest goals conceded in the league this season. Not bad for a first season in the Premier League, is it? The Brazilian came into the Liverpool side, who stand first on the EPL Table, this summer, and there was a huge amount of hope pinned on him, given the massive price tag he came with. Loris Karius’s disaster in the Champions League final is now, though, a thing of the past at Anfield. Alisson has made several big saves to win the Reds some crucial points in their title pursuit, and he will be someone who will be important to them in the run-in as well. From relative obscurity, Matt Doherty has taken barely a season to rise through the ranks to being one of the most consistent performers in each of the EPL Fixtures this season for Wolves. In Nuno Espirito Santo’s 3-5-2, he’s been a vital cog at both ends of the pitch. Popping up with some crucial goals has, of course, helped him make headlines, but his consistently underrated defensive work is what stands out. Although others like Aaron Wan-Bissaka and Trent Alexander-Arnold have had superb seasons as well, the Irishman just pips them in our team. Possible contender to even win the PFA Player of the Year award, isn’t he? Van Dijk is magnificent, and Liverpool fans love him. He’s a leader of men, he’s unflappable, but most importantly, he’s a superb defender. Nearly impossible to beat in an aerial duel, among the quickest centre-backs in the league, and what’s more, he’s yet to be dribbled past all season. Alongside Alisson, he’s led this resurrected Liverpool defence, and he’s possibly leading them to a first title in 30 years as well. This is an unquestionable conclusion. Fourth in the Premier League Team of the Year is Aymeric Laporte, Manchester City bought Laporte last January, to cover for a defence with the oft-injured Vincent Kompany and the oft-inconsistent Nicolas Otamendi. He’s come in, and this season, been an undisputed starter. Much like Van Dijk, Laporte really doesn’t have a weakness in his game. Liverpool and City play different styles of Football, so it’s difficult to compare the two, but Laporte fits City’s perfectly. He’s strong, he’s quick, and he’s got a wand of a left foot, which enables City to start their possession game right from the back. Fifth in the Premier League Team of the Year is Andrew Robertson, who did not really have a competition at left-back this season. Robertson has been streets ahead of his nearest competitor. Like Jose Mourinho said after United lost to Liverpool at Anfield, it is tiring to look at Robertson run and run, with no interval. He’s got himself eight assists in the league as well, forming a lethal partnership with Sadio Mane on Liverpool’s left flank. When he plays, City are so much better for it. That inconsistent period which the defending champions went through in December, losing to Crystal Palace and Leicester City, came without Fernandinho in the side. He’s the hardman in a team of artists. He’s the enabler, in many ways. 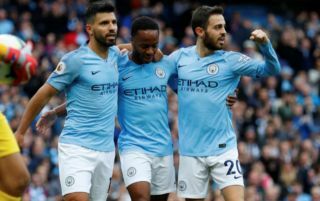 His presence allows the likes of Bernardo Silva and David Silva to move forward at will and join Raheem Sterling and Sergio Aguero in creating havoc. A shoo-in in this side. Seventh in the Premier League Team of the Year is Bernardo Silva who took some time to adapt to life in England, but this season, he’s flown! The best aspect of this season for him has been his ability to change the big games. In the games against Liverpool and Tottenham Hotspur, there was little doubt that he was the best player on the pitch. Apart from being the artist that he is, his tenacity has been a huge plus for City. He covers more ground than anyone on the pitch routinely and that helps City in implementing Guardiola’s meticulous pressing game. Where would Chelsea be without him? Where would they be without his 13 goals and 11 assists? It has been a tumultuous season for Chelsea, but their talisman has stood up and been counted. He’s been the one consistent goalscorer in a side crying out for a few of them. Yes, his form has dipped from the starry highs of the early season, but he’s still been consistent, especially since the turn of the year. Next player in the Premier League Team of the Year is Mohamed Salah with 17 goals, 7 assists. Not bad for a supposedly “bad season”, is it? This season, Salah is still at a level where the other top Premier League players are. He’s just maybe fallen a victim to his own unreal levels that he set last season. Liverpool still need their Egyptian, they’re poorer without him. Defenders are terrified of facing up to him, he’s also learnt to adapt to the lack of goals which could come at times. He’s still dragging defenders out of position, he’s still dribbling past them, and all that is helping Mane and Roberto Firmino around him. It’s not preposterous to say that he is the best English player right now. He’s still consistently improving as well, which is scary. The old Raheem Sterling wouldn’t have 15 goals and 9 assists in a season, given his decision-making in the final third wasn’t great. But this season, he knows exactly what he’s doing. And he’s got a conviction about him. Final Player in the Premier League Team of the Year is Sergio Aguero. Never write the old warhorse off. He’s the leading scorer in the league right now, and there’s no limit to the outrageous things he’s able to do with the football at his feet. We might not see the magic of a Lionel Messi in him, but give him the ball in the box – any part of the box – and you can put your bets on him scoring. 18 goals, more to come, and possibly, another Premier League title to add to an already glittering collection.